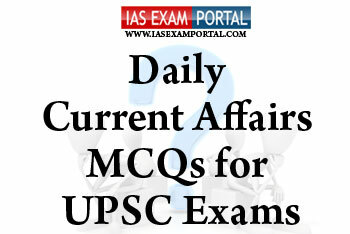 Current Affairs MCQ for UPSC Exams - 9 August 2018 | IAS EXAM PORTAL - India's Largest Community for UPSC Exam Aspirants. Q1. The core zone of this national park was designated as UNESCO world heritage site in 2016,Many of the mountains, peaks, lakes, caves, rocks, Stupas (shrines) and hot springs function as pilgrimage sites. The southern and central landscape, which makes up 86% of the core area, is situated in the Greater Himalayas. Recently the Biosphere Reserve was added to UNESCO’s world network of biospheres. The above description refers to which of the following biosphere reserves in India ? Q2. Which of the following statements regarding recently introduced “swachmanch portal” are true ? 1) It is a web- based platform which aims to bring together every stakeholder contributing to the Swachh Bharat Mission under a common platform. 2) SwachhManch will enable uploads of pictorial evidence of citizens and organizations participating in the initiatives, as well as record the number of hours volunteered. 3) The SwachhManch will also be integrated with the existing Swachhata App to act as a citizens’ grievance redressal platform. Which of the above diseases have been declared officially eliminated from India. Q4. Which of the following are the steps taken by the government to ensure quality of medicines & their available prices affordable to common people. 1) Setting up Special Courts for trial of offences under the Drugs and Cosmetics Act for speedy disposal. 2) Drugs and Cosmetics Rules, 1945 have been amended providing that applicant shall submit the result of bioequivalence study. 3) The licensed manufacturing premises shall be inspected jointly by the Drugs Inspectors of Central Government and State Government every 6 months. Q5. “Kisan credit card” (KCC) scheme is availbale to which of the following sectors in India ?